What Are the Quietest Bicycle Trainers For Apartment? I'll Tell You! Blog What Are the quietest Bicycle Trainer For Apartment? I'll Tell You! What Are the quietest Bicycle Trainer For Apartment? I’ll Tell You! If you’re like me and only use your bicycle for mountain biking and you live in a snowy part of the world in winter, you will have a hard time getting back on the saddle come summer. I was talking to a friend that is way more knowledgeable than me when it comes to biking in general, and he told me that I should join a spinning class for the winter. Let’s just say I’m more of a workout at home kind of guy. So I did some extensive research to find out the quietest bike trainer money could buy! What is the quietest Bicycle Trainer? The quietest Bicycle trainer for indoor cycling is the Stac Zero Bike Trainer. The braking technology generates resistance by utilizing magnets that slow the back wheel down without actually making physical contact with the bicycle wheel itself. Indore cycling has always been something I avoided since I would much rather mountain bike in my local MTB trail system. I also just purchased a Trek Farley 9 Fatbike for winter use. Our trails are well groomed in the winter, so this will give me a much-needed winter sport. All of this is not enough, however, to keep me in optimal shape to be able to use my bicycle without gasping for air after ten minutes of riding. I was looking for an exercise bike for home, but they are between $500 to $1000 for a good quality one while a good bicycle trainer is only around $100 to $300. Since I already paid well over a thousand dollars for my bicycle, I figured I might as well put it to good use even when there’s snow on the ground. I was not only looking for the best bicycle trainer but most importantly for me, the quietest bicycle trainer. A quiet bike trainer is crucial for me because I like working out later in the evening when my three kids are in bed. After looking through many Reddit Forums and reading over a hundred, ok maybe fifty Amazon reviews I came up with not only the bike trainer I was going to buy but also the top 10 most quiet bike trainer. Ok, I quit after number 4 on this list because I didn’t see the purpose of continuing. You should be able to easily chose one of the four because they are all awesomely quiet. Having a quiet bike trainer is essential, especially if your bicycle training on an upper level of a home or apartment. Myself I have mine in the basement, but I wanted it to be quiet mostly so I could hear the television without cranking the volume and not wake up the kiddos. Do I Need to Buy a Skewer or can I Use the One on My Bike? How Much Should You Pay for a Bicycle Trainer? An indoor bicycle trainer, also known as a turbo trainer, allows you to affix the rear wheel of your bike to it and cycle inside your home. A bicycle trainer will help you stay in optimum shape for outdoor mountain and road biking. Additionally, it is excellent for those that intend to learn how to ride a bike by knowing exactly how each of the gears feels. Another useful benefit of using a bicycle trainer is that you can use your bicycle year round. Many cyclists and mountain bikers would end up paying well over a thousand dollars for their bicycle so being able to make use of it all year is a bonus. By using your own bike, you will end up saving money since you won’t have to pay hundreds of dollars for a stationary bike. They can even be made use of in your backyard on a beautiful day because of its small size and mobility. The indoor bike trainer can be used wherever your bicycle will fit, even if the rooms in your home are small. You can leave your bicycle attached on the trainer for the winter. You can also detach your bike and fold the trainer for easy space saving storage. 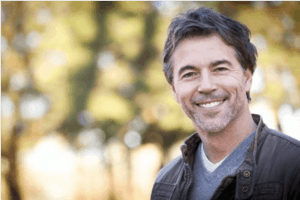 Being able to find the right bicycle trainer for your home can be a confusing task because of all of the different types available. The different types of bike trainers can have a significant impact on the impact of their performance, of course, the amount of noise they produce. I’ve gathered a small list of essential features for bicycle trainers. These are the type of things you should look for and find out which type of bicycle trainer is best suited for you when making your final decision. 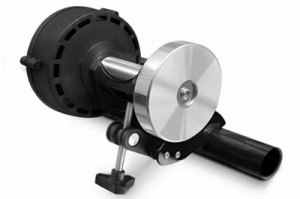 A fluid bike trainer is equipped with a flywheel mechanism that is driven by the rear wheel of the bicycle. The resistance comes from a spinning impeller inside a type of fluid that gets thicker as it gets warmer. The temperature of the fluid increases creating more resistance as you’re pedaling making every extra mile more challenging. After digging a bit deeper on fluid bicycle trainers, I found out that in the past some would have a defect where they would eventually leak. Apparently, according to a popular bicycle website, they have since fixed this issue, and newer models should not leak. Make sure to check them thoroughly if you’re in the process of buying a used fluid bike trainer. If the fluid bike trainer is sealed, then you should not have any problems regarding leakage. If they are equipped with a gasket seal leakage could become an issue down the road. Mag trainers, also known as magnetic bike trainers use alterable magnetic resistance to create friction against the rear bicycle wheel. 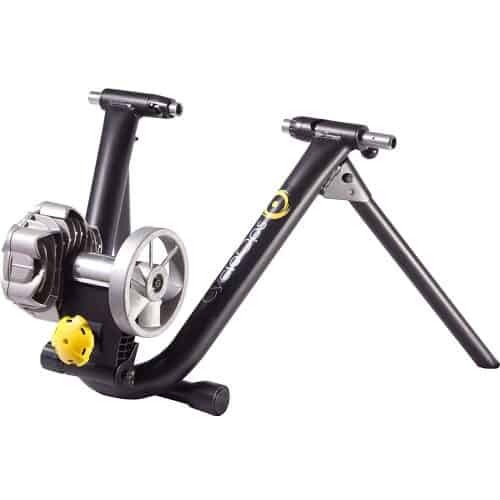 The mag trainer’s drive is a flywheel that is equipped with rotating magnets that will generate an adjustable amount of resistance as you peddle. One setback to some is that you need to get off the bike if you want to change the resistance setting. There is an alternative to this by attaching a cable from the handlebar to the bike trainer. Most of the magnetic bike trainers will give you the smoothest ride if you go with a mid to high priced option. The technology of magnetic trainers is quite simplistic with its progressive resistance, so there should not be any issues of failure down the road. An advantage of progressive resistance is that it makes it close to impossible to overpower the bike trainer as your level of endurance increases. If your purpose is to log on some mileage, then this should do the trick. But if you’re looking for the quietest bike trainer, then mag trainers might not be the best choice since they can be noisier than some of the alternatives. Wind resistant bike trainers generate resistance by rotating a bladed fan through the air. The resistance is progressive, but advanced riders may require more resistance as they advance their training. These are more suited for beginners, but moderate cyclist might also find this type of bicycle trainer sufficient for their needs. 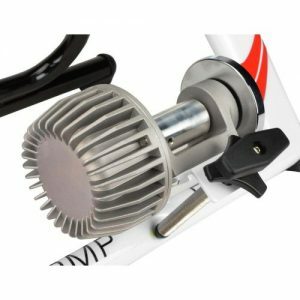 The flywheel on a wind bike trainer resembles the momentum of the bike and rider; Raising the force needed to accelerate and sustaining speed when coasting. Wind bike trainers closely simulate road biking but are on the noisier side of things depending on the one you buy. These types of bike trainers are also inexpensive; Which is another reason why they are attractive to beginners that do not yet know if they will even like using a bicycle trainer. 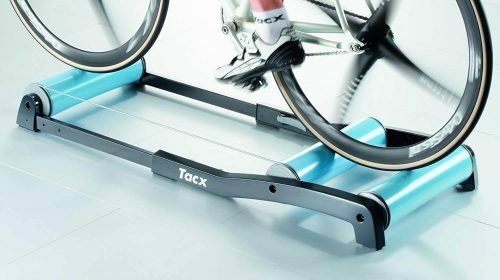 Ok, bike rollers are not considered a bicycle trainer, but since it’s purpose is for indoor cycling by using your bicycle I decided to add it on the list. There are indeed pros and cons to using bike rollers, but to me, the cons outweigh the pros, primarily if you’ve never used one of these before. Since the bicycle is not attached to anything, it takes a good amount of talent and practice to be able to use a bicycle roller. One pro is that they are on the less expensive side of bike trainers. They would compare in price to a bottom of the line bike trainer. I’ve personally never tried bike rollers, but I will get one someday if I can find a cheap used one online. I don’t want to spend a bunch of money on something that I might not even be able to use to their full potential. Bike rollers can be quiet, but it depends how noisy your bicycle is while riding; and also the ruggedness of the wheels will also be a factor regarding noise. Here is my top four list of the quietest bike trainer for use in an apartment especially because heck, who needs ten choices, it just makes it that much more difficult to decide. 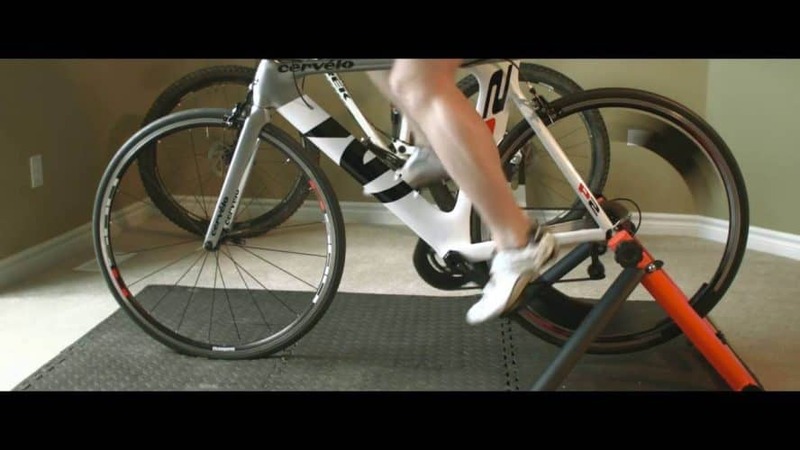 The stack zero bike trainer is self-proclaimed to be quietest bike trainer in the world. One thing is for sure, not one bike trainer in the world would be able to be completely silent, but this one is certainly close to being mute. The braking technology generates resistance by utilizing magnets that slow the wheel down without actually making physical contact with the bicycle wheel. The Stac Zero works with most alloy wheels on mountain bikes and road bikes. You’ll need to forget about this bicycle trainer if you have carbon wheels because they are not compatible to use with this trainer. This is also the case with steel beaded tires or wheels that have a steel pin. This particular bicycle trainer is a bit on the pricey side of things but is certainly not the most expensive one out there. Sometimes it is better to spend a bit more money on something that will last you much longer than some alternatives. 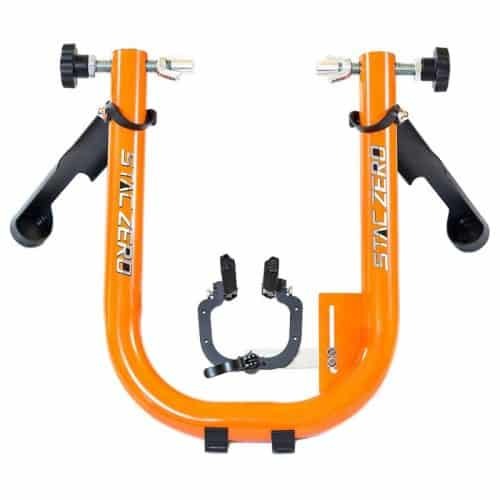 The CycleOps Fluid2 Indoor Bike Trainer is the most popular of the bunch and the best selling bicycle trainer on the market today; And is almost as quiet as the Stac Zero Bike Trainer. This bicycle trainer comes equipped with a large, precision-balanced flywheel that lets you quickly customize each ride easily by shifting gears, just as you would when riding outdoors. This design also helps keep your Fluid working better for a much longer period. To convince people that this fluid bicycle trainer won’t leak and will stand the test of time they include a FULL lifetime warranty directly from CycleOps. Some trainers say “lifetime warranty” but ONLY if there is a manufacturer defect. Defects are a bit harder to prove, so make sure to read what the warranty entails if that is one of your concerns. The roller size is 2 inches and will give you the usual wear on the tire. I recommend using a trainer tire because it will save your tire from wear and will be much quieter than your regular tire. Some people that claim that this bicycle trainer is loud should swap their tire with a trainer tire and will understand exactly why it was loud. There is no remote adjustment, but the resistance on the tire from the bike trainer is constant throughout the training session and cannot be adjusted without getting off the bike. However, that’s not the goal of this bicycle trainer, unlike a spin bike, you have gears on your actual bicycle. By using your shifter and moving up and down the rear ring, you will provide yourself with lots of resistance and can switch gears as often as you need to mimic climbing, speed work, and recovery. Fluid bicycle trainers are some of the greatest means to get an indoor workout that resembles the feel and struggle of road riding. This bike trainer will fit wheel sizes all the way up to a 29er and comes 90% assembled. The only thing you need to do is to set up the power meter and fine-tune the cam-lock system. It was also straightforward to set up the power head-unit. The Cascade FluidPro is another bicycle trainer that comes with a lifetime warranty. Make sure you register the unit within 30 days of purchase. A unique lever system makes locking in the bicycle quick and easy. Another feature that is not common on all bike trainers is the weight of the flywheel. The flywheel is heavier than most other bike trainers at 7 pounds and gives the rider a road feel that is much closer to the real thing. You certainly won’t be disappointed if you decide to go with this bicycle trainer, especially if noise is one of your biggest concerns. Kinetic is one of the world’s most dependable bicycle trainer producers. It is also within a price range that should satisfy beginners that are not quite sure if using a bicycle trainer is right for them. If you’re into mountain biking as much as I am then this is an excellent choice because they work exceptionally well with mountain bikes even though it’s called a road machine. Do not be fooled; this bicycle trainer is not only intended for road bikes. This is yet another one of the quietest bicycle trainers out there for the price. 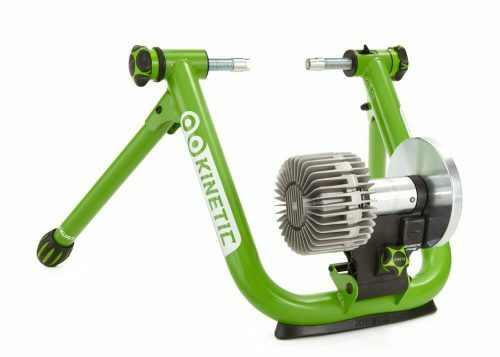 The Kinetic Fluid Indoor Bike Trainer is perfect for beginners and pros alike and should suit everyone’s indoor cycling needs. One important factor to consider while looking for a quiet bicycle trainer is if your bicycle is even compatible with the bike trainer you’re about to buy. This is important because I assumed that every bike trainer would be compatible with any bikes out there. Well, that isn’t always the case because my mountain bike was not compatible with the first trainer I bought and had to return. It wasn’t the bike precisely that was not compatible with the bicycle trainer but the wheel that was the problem. Many modern mountain bikes on the market today, including mine (Trek Fuel EX8) come equipped with 29-inch wheels. Many bike trainers on the market can only accommodate bicycles with wheels size between 26 and 28 inches. Make sure to look that up if you have a different type of wheel size. I notice of some forums that a lot of people are asking this question, do I need to buy a skewer or can I use the one on my bicycle? Well, the answer is that there is usually a skewer that comes with the bicycle trainer, so you will not need to buy one. 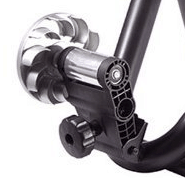 A reason why the one that is on your bicycle would not be good to use in most cases is that the skewer that comes in the box of the bike trainer is designed to be perfectly compatible with the specific bicycle trainer. So the moral of the story is wait because you probably have one coming in the box. Every indoor bicycle trainer will make some noise because of the vibrations, but some types are noisier than others. Wind trainers are usually very loud. Magnetic and also fluid trainers are quieter, making them ideal for apartment tenants or people with roommates. 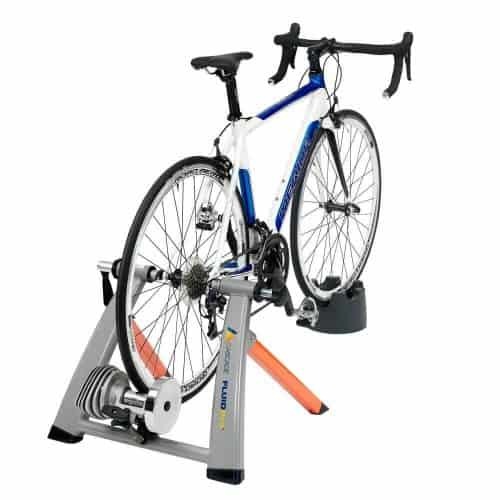 Indoor bicycle trainers come in a wide range of prices; this is dependent on the model, type and features they can offer. But overall you can expect to dish out from $50 to well over $500. For the fluid bike trainers, like most of them on our list, you will pay between $140 and $350. The wind bike trainers and the magnetic trainers offer some of the lowest prices varying between $30 and $100. If you’re aiming more towards a roller bicycle trainer, you should expect to pay between $100 and $200 for a decent model. The first tip is at the time when you’re about to set up your new bike trainer. If possible, set up your bicycle trainer in your basement or garage to not disturb anyone in your home; and most importantly, these two spaces are some of the cooler areas of a home that doesn’t have central air conditioning. You do not want to overheat yourself when using your bike trainer. Before you saddle up on your bicycle, make sure to have water and a towel nearby since you’ll most likely be sweating in no time. Also, Eat something a few hours prior to cycling to build up enough energy for a proper workout. Before any type of strenuous workout, you should always warm up your body. You can accomplish this by starting off with an easy 5 minute of cycling before going to a more difficult setting. Just like your warm up, do a moderate 5-minute cooldown ride at the end. One of the best types of cardio workouts I know is intervals. I find that interval workouts are the ones where I sweat the most, even with the small breaks in between. What I mean by interval workouts is going at your max for 4 minutes and then slowing down to catch your breath for a couple of minutes. Repeat this over and over again and you will see for yourself that this will give you a much better workout versus going the same pace through your training. These four bicycle trainers would be a great choice whether you’re trying to find a quiet bike trainer for an apartment or you’re just searching for an all-around great product. I was going to buy a stationary bike last year but decided to go with a bicycle trainer (CycleOps Fluid2 Indoor Trainer) and I have absolutely no regrets. Honestly, I didn’t even know these things existed before a couple of years ago until my neighbor introduced me to his bike trainer. I was sold from day one! Please let me know in the comment section if you have any of these bike trainers and what you think of them. All other questions and information are welcome. If I don’t know the answer I will find out and let everyone in the community know so we can all learn together. Check out our YouTube channel for some awesome soundproofing videos.